uuid : 5bf0339c-e7d2-42e3-95c9-08fa026e7cae templates_id: 119478 templates_uuid: "56738363-cce7-4798-a685-e850dd198d11" title: "Employment contract amendment letter - Change to employment terms letter" display_name: "Change to employment terms letter" meta_keywords: "Employment agreement amendment" description: "
Make sure you\'re legally compliant when you want to change an employee\'s contract with this letter changing terms and conditions of employment. This letter sets out a proposed change to the terms and conditions of employment and will ensure you get the employee\'s proper consent to the change. What are some common changes to employment contract terms and conditions? How can changes to terms of employment be made? implication by way of a change in long standing custom and practice (eg if an employer allows a day off each year for New Year\302\222s Eve). Changes without agreement can only be made if the employment contract says so (eg place of work may change). For these types of changes to be enforced, they must be included in a clearly worded clause, often referred to as a flexibility clause. Although, a change that is impossible for employees to comply (eg to relocate overseas with one week\302\222s notice) cannot be enforced. Even if an employer has the right to impose a change, it helps things to go smoothly if the reason why the change is being made is explained. A brief factual description that employees understand and makes business sense within this notification letter is usually enough. What is a consultation meeting? After a change to employment terms letter has been sent, you should organise a consultation meeting. The consultation meeting is an opportunity for the employer and employee to discuss the changes and will help make sure that the process goes smoothly. It is also an opportunity to identify and propose alternative ideas as well as to communicate any future plans (which could include possible retirement plans for older workers). If there is no contractual right to make the proposed change but it is necessary to do so, then consultation will be an essential part of a fair process and necessary to ensure that the employer is not exercising its rights in an unreasonable way. Do employers have to offer compensation for a change? Even when you have the right to impose a change, it sometimes makes sense to offer something in return and help employees feel fairly treated. In some cases, the right to make the change in the first place requires that something is being given in return (eg that a particular benefit can be withdrawn provided that an equivalent benefit is offered). What if changes have been made without agreement? Imposing a change without either a contractual right or the employee\302\222s consent is likely to be a breach of contract and could be considered constructive dismissal. What if an employee refuses to agree to a change? If an employee does not agree with the proposed change, you should attempt to resolve the disagreement informally by talking to them or by using mediation. If the employee still refuses to agree, then, as a last resort the employer can end their contract (using the correct dismissal procedure) and re-employ them, or someone else, using a new employment contract. What if an employee wants to change their employment contract? An employee only has the right to insist on changes covered by legal rights (eg opting out of Sunday working or the 48-hour working week). If the business owners change (because it has been sold), and there are no changes to the terms of the employment contract, then employers will only need to write to the affected employees within a month of the change. New employment contracts are not required. If there are any changes to the actual terms of employment, then a new employment contract (with the new business/owner) must be issued within two months.
" created_timestamp: "2018-10-08 04:36:15.0" modified_timestamp: "2018-10-08 04:36:15.0" active: true created_by: 246 modified_by: 246 dcm_id: 225 url_slug: "Change-to-employment-terms-letter" meta_description: "Prepare a letter changing terms and conditions of employment with simple guidance from Rocket Lawyer. Make sure you\'re legally compliant when you want a change of employment contract with help from expert solicitors when you need it." time_to_complete: "10 minutes" role1: "Employer" role2: "Employee"
Make sure you're legally compliant when you want to change an employee's contract with this letter changing terms and conditions of employment. This letter sets out a proposed change to the terms and conditions of employment and will ensure you get the employee's proper consent to the change. implication by way of a change in long standing custom and practice (eg if an employer allows a day off each year for New Years Eve). Changes without agreement can only be made if the employment contract says so (eg place of work may change). For these types of changes to be enforced, they must be included in a clearly worded clause, often referred to as a flexibility clause. Although, a change that is impossible for employees to comply (eg to relocate overseas with one weeks notice) cannot be enforced. Imposing a change without either a contractual right or the employees consent is likely to be a breach of contract and could be considered constructive dismissal. More than just a Change to employment terms letter template, our step-by-step interview and guidance makes it easy to create your document. 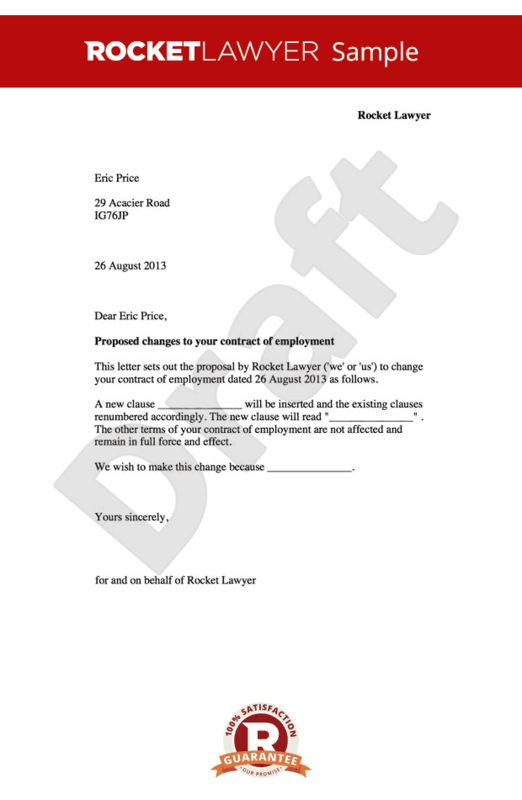 Easily create online, download, print and sign your free Change to employment terms letter in minutes. This document is also sometimes called: Employment agreement amendment.